Ebola. Just the word by itself instills fear. But in some corners of our shared planet it presents itself as an all too real horror that invades communities, neighborhoods, and families. As this crisis has been unfolding, we at Symplur have been following the same news reports that all of you have with regards to the spread of this disease, the increasing death toll, and concerns of containment. 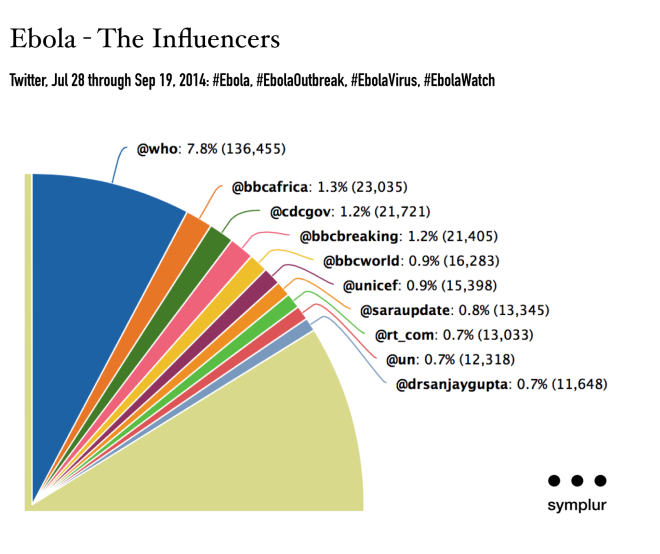 We’ve also been following Ebola through the unique lens that healthcare social media provides. On July 28, 2014 the current Ebola outbreak hit the mainstream news in the U.S. That morning Symplur began tracking it on Twitter via several hashtags including #Ebola #EbolaOutbreak, #EbolaVirus and #EbolaWatch. 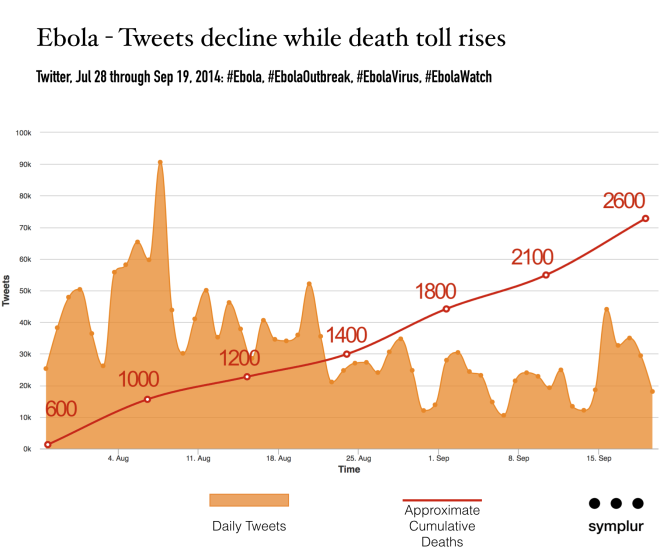 During this time, our analysis has uncovered some obvious trends in the social media discussion on Ebola. Most notably, we’ve noticed that Ebola on social media has not mimicked the real-world trend of this virus itself. As the death toll has risen, the public discussion has waned. Today’s media includes stories from around the world, but our ability to ingest all these new stories remains limited by both time and sheer brain-power. Consequently, the media itself decides which stories to tell, and even more so which stories to push. A story can be brewing for some time, but until it explodes into a headline the common citizen remains focused on other things. 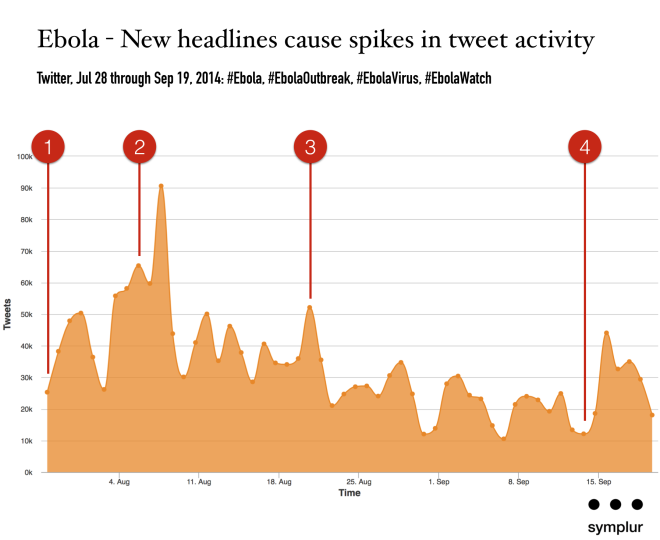 We can see how leading news stories have impacted the Ebola discussion on Twitter as each time there was a “new” lead story attached to it there was an obvious spike on that day or the day(s) following. July 28, 2014 – Ebola outbreak is the lead story on morning news in U.S.
August 5, 2014 – Second U.S. Ebola patient arrives at hospital in Atlanta, Georgia. August 21, 2014 – First U.S. Ebola patient is discharged from hospital in Atlanta, Georgia. September 15, 2014 – President Obama announces that the U.S. is sending up to 3,000 troops to West Africa to assist in responding to Ebola outbreak. Most conversations, in both the physical and online worlds, go through an evolution as facts, awareness, and perceived relevance ebbs and flows. Part of this evolution includes changes in who is participating in the conversation itself. With Ebola on Twitter this evolution uncovers some significant details. For starters, as the Ebola story broke on the U.S. airwaves, we could easily see that residents from the geographic areas afflicted were largely absent on Twitter. It should be noted that tracking location on Twitter has it’s challenges, as only about 1% of tweets are geo-tagged. However, we have several other ways that help us to pinpoint location, and in the period studied we were able to identify location for 50% of the nearly 1.8 million tweets studied. The following is a list of countries that have now had identified cases of Ebola, and how many participants we’ve identified who were involved in the Twitter conversation on that topic during the first two weeks studied. This shouldn’t surprise us, because even though much of the world is “on the grid”, those areas currently being so actively threatened by Ebola are by-and-large not as privileged as the majority of you who are reading this. Consequently, a social media presence is expected to be slow and minimal in those locations where the outbreak has been occurring. 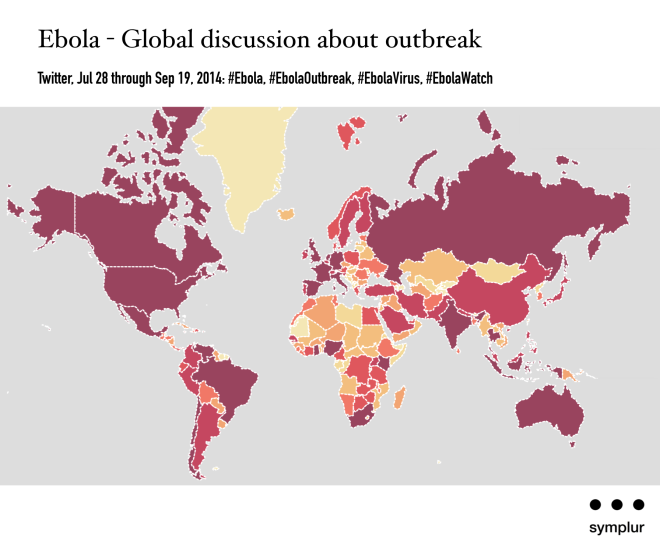 Over time we can see that the topic of Ebola began to take hold as a global discussion on social media. Below is a heat-map that displays this world wide attention being paid to this story on Twitter. Darker colors represent more participants in the Ebola conversation. And we can see how that has evolved over time in select countries listed below as we look at the identified number of participants and their locations. What’s more, there are 51 primary languages spoken by the participants in the Ebola conversation on Twitter, with English, French, Spanish, Italian and Thai leading the way. We can also see a difference in Twitter activity when comparing doctor participation to that of the general population. Of the the 600,910 unique participants in the Ebola discussion, the average user has tweeted on that topic only 2.98 times. However, U.S. physicians tweeting about Ebola have done so on average 9.37 times. That’s over three times more participation than the average user. 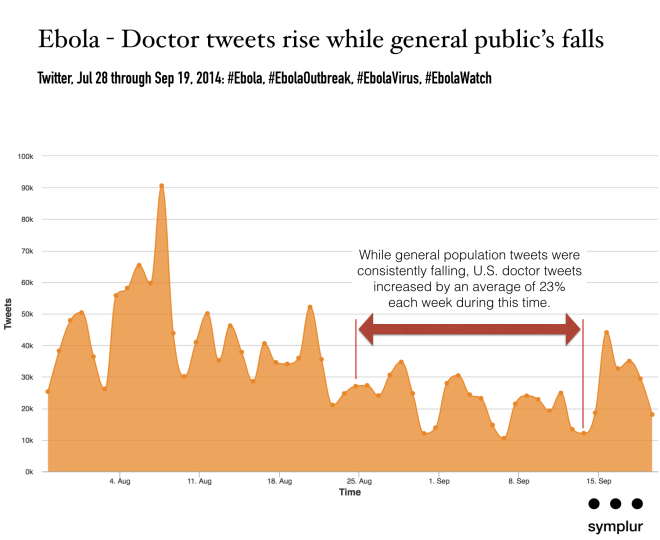 Another positive trend that we can see among doctors tweeting about Ebola is that while the general public’s interest began to wane, as described earlier in this post, U.S. doctors actually accelerated their activity week over week during the same period. What’s more doctors included links in 68% of their tweets. Their most popular overall source of articles linked to has been The New England Journal of Medicine, but their most popular single link has been to the CDC website’s article on “Infection Prevention and Control Recommendations for Hospitalized Patients with Known or Suspected Ebola Hemorrhagic Fever in U.S. Hospitals”. It’s also worth noting that when comparing the ten most shared articles by doctors vs. those by the general public that there has been no overlap of links that the two groups are sharing. Is the public missing something here? So with so much activity and sharing of information, what parties are influencing this discussion the most? Are they trusted sources of good information? Or are they spreading rumor, marginal information, and further panic? A quick look at the ten participants who are most often mentioned, our preferred measure of influence on Twitter, reveals The World Health Organization (@WHO) at the very top. Also among the influencers are the U.S. Centers for Disease Control and Prevention (@CDCgov), several news outlets, humanitarian organizations, and a well known physician. So, certainly on the social media front, it seems that at least some of the proper parties are leading the way. It’s reassuring to see The World Health Organization right where we would hope they would be as the foremost voice. And it’s also encouraging, as noted earlier, how some doctors have become active participants and have been sharing their thoughts and insights at an increasing rate. Here’s hoping that we don’t let our attention wane again on such a serious issue. If we do, the consequences may haunt us.